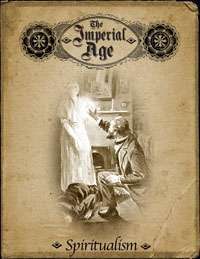 Adamant Entertainment is proud to present The Imperial Age, our line of Victorian/Steampunk products, made for use with d20 Modern or Past. Spiritualism is the belief that man can interact with spirits of the dead in order to learn information and improve himself (some Spiritualists, especially Christian Spiritualists, extend this interaction to include supernatural beings such as angels), which spread in popularity during the Imperial Age. Practitioners of Spiritualism are generally known as Mediums. As the name implies, a Medium is the conduit through which spirits and other outsiders can interact with the physical world. While this title conjures images of seances in darkened rooms, mediums were considered capable of healing as well as divination. The Imperial Age: Spiritualismis your guide to the belief which spread like wildfire throughout the western world in the latter half of the 19th century, as many people cast aside their old beliefs in favour of what they learned through direct contact with the afterlife. Contained within this 17-page supplement: an overview of Spiritualism, including the major groups which proliferated during the Imperial Age; a guide to using Spiritualism in five different campaign styles, including Adventure Hooks; an advanced class which allows you to add Mediums to your Victorian-era campaign; and new incantations and feats. Requires the use of the d20 Modern Roleplaying Game, published by Wizards of the Coast, Inc. d20 Modern, and Wizards of the Coast are trademarks of Wizards of the Coast, Inc. in the United States and other countries and are used with permission. 'D20 System' and the 'D20 System' logo are Trademarks owned by Wizards of the Coast and are used according to the terms of the D20 System License version 3.0. A copy of this License can be found at www.wizards.com/d20. All text within this product is 100% Open Content.